Originally from the NYC metropolitan area, Deborah-Miriam now lives in the tree-covered mountains of Southern Oregon, more closely attuned to the earth, and committed to following the guidance of Spirit. In 2004-05, she was trained to do SRT akashic record clearing and Emotional Freedom Technique (EFT), studying directly with founders Robert Detzler (z"l) and Gary Craig. She has honed her intuitive skills while working one-on-one, and leading group clearings via teleconference with participants from the US, Canada, Mexico, UK and Australia. Among her clients are individuals from all walks of life - familes, coaches, healers, and beginning and advanced spiritual seekers. 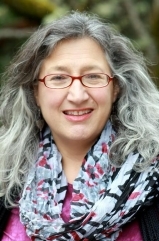 Clients appreciate Deborah-Miriam's integrity, deep listening, positive energy and intuition.